Very many in the world honour the heroic sacrifice that over 20 million Russian people and other nationalities in the Soviet Union done on behalf of mankind. 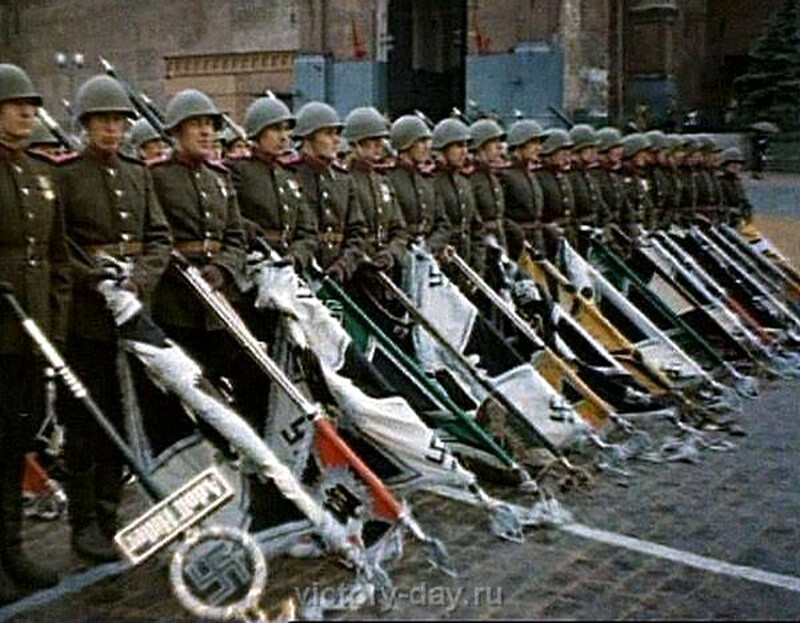 They took the main share amidst the allies’ forces in liberating Europe of fascism. 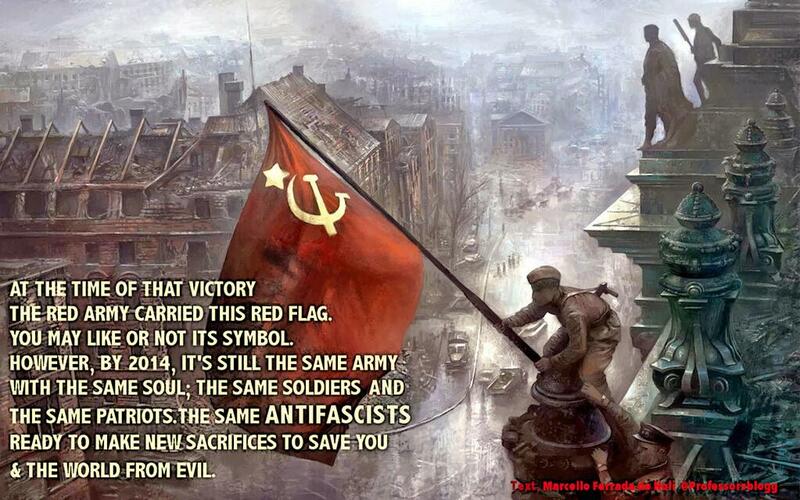 And of course very many in Sweden too, recognize that to Russia, formerly the Soviet Union. 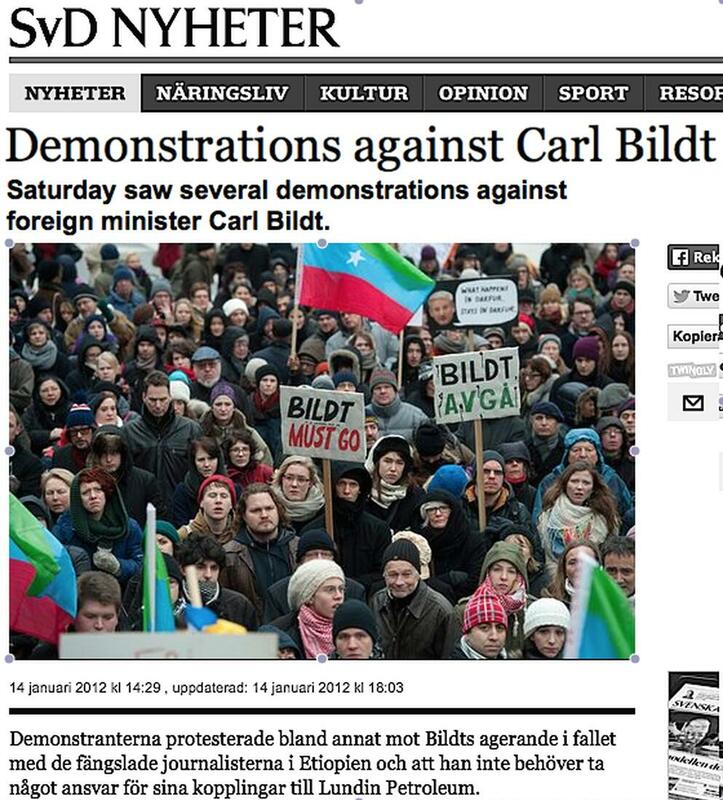 But we have some exceptions, and a prominent of among those is our fanatic Russophobe Foreign Minister Carl Bildt. His unique support for the fascist junta in Kiev has deserved criticism even in Swedish diplomatic circles (See A Swedish Extremist Right-wing “Diplomacy”? 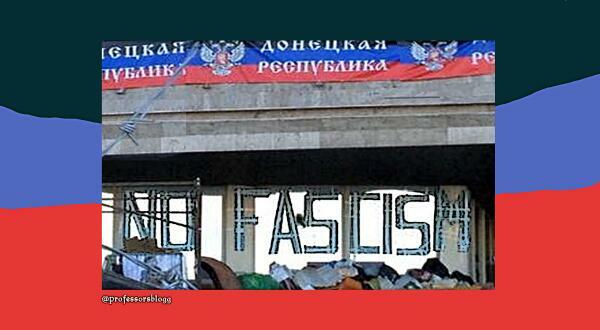 Or Bildt’s Solo Support To Ukraine Nationalists? 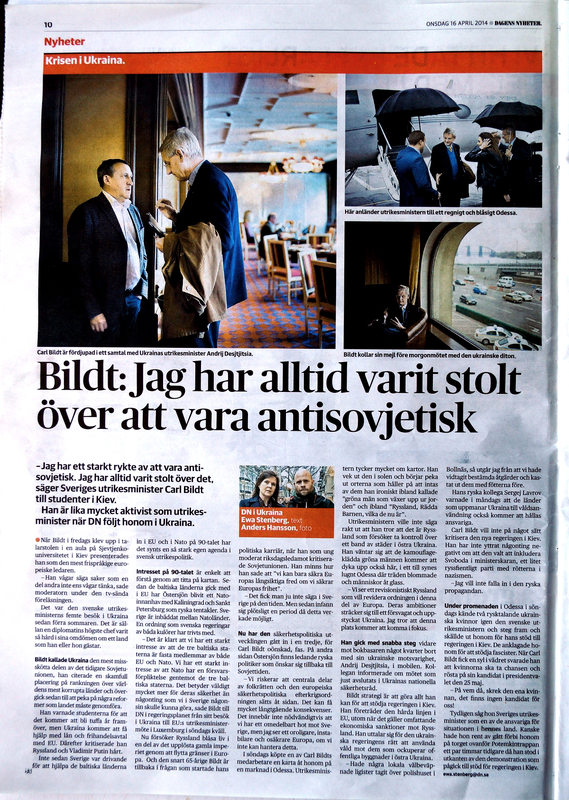 , and Criticism to Bildt’s foreign policy widens in Sweden). 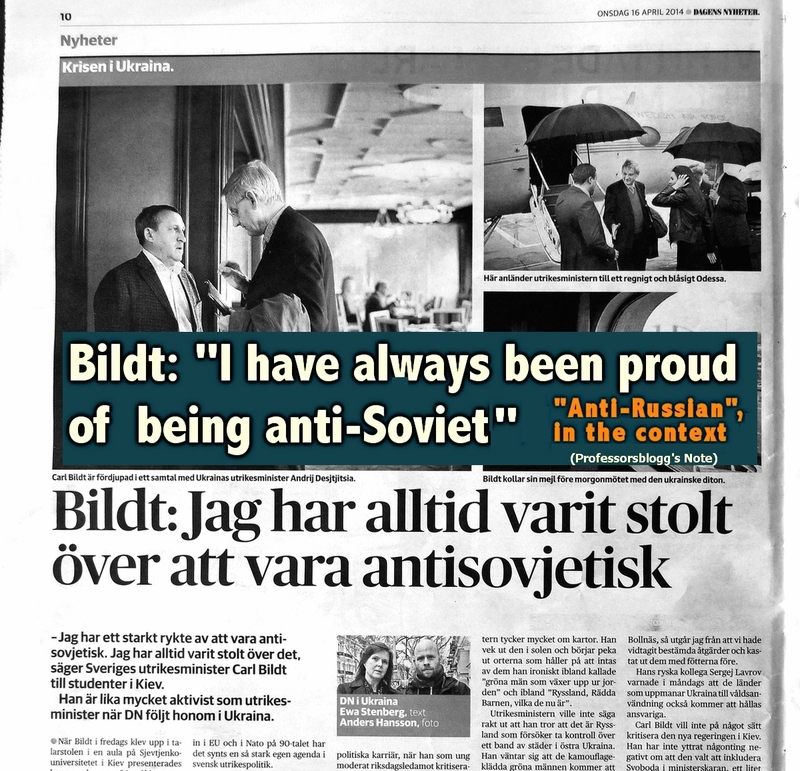 During his public address recently in Kiev, and in the context of the situation in Ukraine that according to Bildt has only Russia to be blamed for, he said “I have always been proud of being anti-Soviet”. This is what he declared recently in Sweden’s main paper Dagens Nyheter (16 April 204). It was a full page article that DN did not have the courage to publish it on line. Professors’ Blog kept this image (thumb at left and clip above) taken from the printed version that only Swedes could see ­ but not the world. It is undoubtedly part of the NATO-prone brainwashing propaganda-war that the indecent Swedish stream media wages to convince the Swedish people of the Ukraine fascist junta’s “righteous” stance. I have to, in the strongest terms, make clear that Carl Bildt, or for that part his vassal Swedish TV and DN do not represent the Swedish people. In fact 1, Swedes have been cultivated in decades, not only in the decent praxis of geopolitical Neutrality between superpowers, but also – and most important – in the tradition of solution-seeking and mediating for peace in international conflicts. Hence, I honestly do not believe that most of Swedes feel confortable with the new geopolitical role assigned by the extreme rightist politician Carl Bildt. In fact 2, Carl Bildt can hardly IN TRUE represent the Swedish people on those issues, or in any foreign policy issue for part. He was NOT ELECTED by the Swedes to be in charge of their foreign policy. He was only DESIGNATED, individually co-opted by PM Reindfeldt in a move to appease the hardliner fraction of his party, the Moderates. Ergo, the behaviour of Carl Bildt in the international arena does not correspond to the wishes or the idiosyncrasy of the majority of the Swedish people. Further, the split it does not only regard a dichotomy between Bildt and the people at large; Bildt’s international political behaviour not seldom collides with the stances of PM Reinfeldt himself. For instance, when the Ukraine crisis erupted in the aftermath of the US-backed putsch that installed the current illegitimate regime of Kiev, the Swedish Prime Minister expressed “understanding” on that Moscow reacted in protecting the Russian ethnic minority in Eastern Ukraine. The reaction to that of Bildt, and the exploitation of that internal contradiction done by the US-loyal media apparatus of Sweden (both the Sate-owned media and the private MSM monopoly], pushed Reinfeldt to state other positions afterwards, closer to Bildt’s. That was, in my opinion, an opportunistic and ill-fated move by the Swedish government. This is in merit of a) the actual situation of the aforementioned minorities with regard to the Kiev regime has instead worsened; b) the move placed Sweden’s national security in precarious stance. 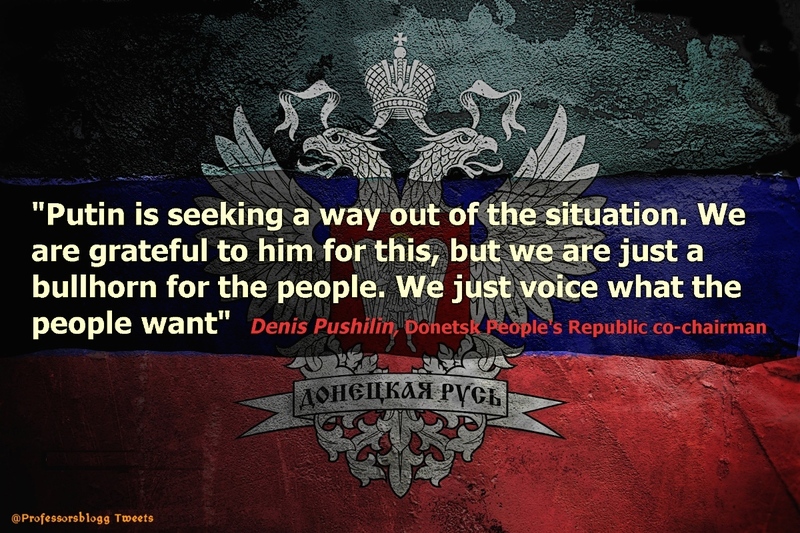 Finally, to make my position clear on the Ukraine crisis.